Latest Weather and Heat Advisory for Canine Carnival: We know that it will be very hot and humid tomorrow, with the risk of passing showers and a possible thunderstorm. We’ve had some questions about rescheduling or postponing due to weather. Please know that we will be there tomorrow, rain or shine. 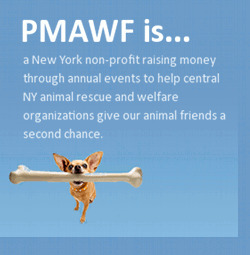 The PMAWF is a 100% volunteer run organization, and the Canine Carnival is 100% volunteer run and organized. We have too many moving pieces to consider rescheduling. Safety considerations: Humans and dogs with underlying medical issues should consider staying home. Some breeds of dogs at risk in heat include Bulldogs, pugs, French Bulldogs, and dogs with heavy coats. Owners of these types of dogs should probably leave their dogs at home tomorrow. That said, we encourage you to come out, have fun, make connections with the wonderful organizations who will be here, and support our local rescues! We have misting tents, plenty of water and drinks for pets and people, and abundant medical staff onsite. We’re looking forward to seeing you! This entry was posted on Saturday, August 13th, 2016 at 5:58 am	and is filed under Uncategorized. You can follow any responses to this entry through the RSS 2.0 feed. Both comments and pings are currently closed.